Premier Houseboats are pleased to present Res Nova, a charming and cosy cruising barge offering surprising space together with ease of navigation. Res Nova offers an ideal balance, spacious enough for living whilst static, and the right size to cruise waterways both at home and in Europe. Res Nova has a good sized wheelhouse, offering panoramic views that make it a comfortable sitting area, but also safe to handle if cruising. There is built in seating and this wheelhouse can really make the most of your surroundings wherever you find yourself. Steps lead back to the wet room, with shower, hand basin and sea toilet. Although a little low on headroom, the shower has a well that allows full standing height whilst in use. Along from the wet room is a good sized double cabin, with built in double bed and plenty of storage. Forward from the wheelhouse steps lead down to the main saloon, a good sized area again with plenty of built in storage and good light. There is a solid fuel stove here with a fan to ensure heat can be spread throughout the boat when in use. In the corner is the galley area, with free standing gas oven, ample storage and work surface, and a sink. There is a gas heater that supplies hot water whether in the galley or the shower. A doorway leads through to the second cabin, this currently has two single berths but could if needed become a double V berth. 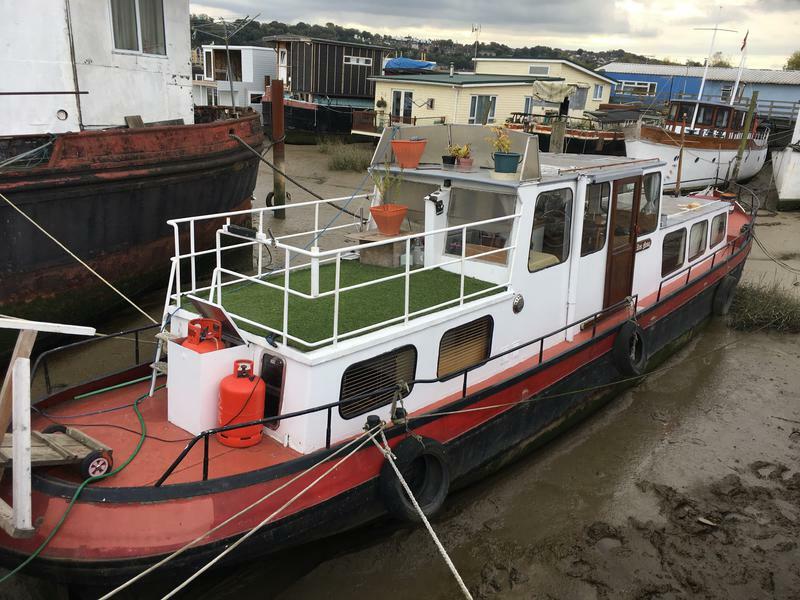 Externally there is nice deck space behind the wheelhouse, with railings around and astro turf, and could comfortably fit a table and chairs to enjoy long summer evenings on the river. Overall, offering a good size to live or cruise, and on a secure residential mooring opposite Rochester Castle, Res Nova is an affordable opportunity for a change of lifestyle to enjoy living afloat. Vessel name: Res Nova Vessel condition: Good Year constructed: 1925 Berths: 4 Cabins: 2 Heads: 1 No. of engines: 1 Length over all: 50' Beam: 10' 3" Maximum draft: 3' Bridge clearance: 8' 2" Hull material: Steel Hull type: Flat Disclaimer Premier Houseboats offers the details of this advert in good faith as it was presented by the seller or his representative but cannot guarantee or warrant the accuracy of this information nor warrant the condition of the described item within this advert. A buyer should instruct his agents, or his surveyors, to investigate such details as the buyer desires validated. The Item described within this advert is offered subject to prior sale, price change, or withdrawal without notice.